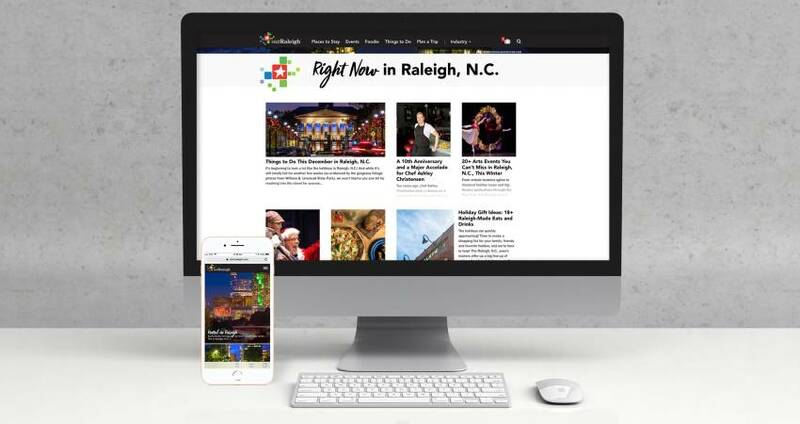 If you have been in any of our partner meetings recently, you know that we have been working this past year on a complete redesign of visitRaleigh.com. We launched the new site quietly last Wed., Dec. 13, 2017, to allow us to work out any glitches before we called too much new attention to it. We are continuing to polish (and we will for some time), but the site is ready now for you to take a look at and to share liberally with your friends, relatives, clients, customers and colleagues. We’re proud of it, and we hope you are, too. There are lots of things that we could say about it, but to our partners in the hospitality community, here are the three things we most want you to know. ...from the way it’s structured navigationally to the editorial content to the imagery. We used several resources in our decision-making, including recent visitor profile data, the researched destination brand strategy, past website traffic usage trends, as well as in-person interviews with representative users of the old site, as well as the new site while in testing stages. This site was developed by Simpleview, a company with international clientele which specializes in website development for the CVB or DMO industry. Our staff started working with Simpleview&apos;s site team over a year ago, concepting the design and sitemap structure and have worked closely with them since on myriad steps toward launch, including content management support and destination database integrations. They are the leaders in the industry and brought invaluable know-how to the project, related to the best practices for DMO websites and analysis of the research relating to Raleigh, N.C.
2. This website is content-driven. The old site (as has been true of many DMO websites) was largely listings-oriented (somewhat like a digital version of a comprehensive Visitors Guide or Chamber guide with business listings). Once a listings page was created, it basically stayed the same until the next update, though partner listings were adjusted due to openings, closings or other changes. 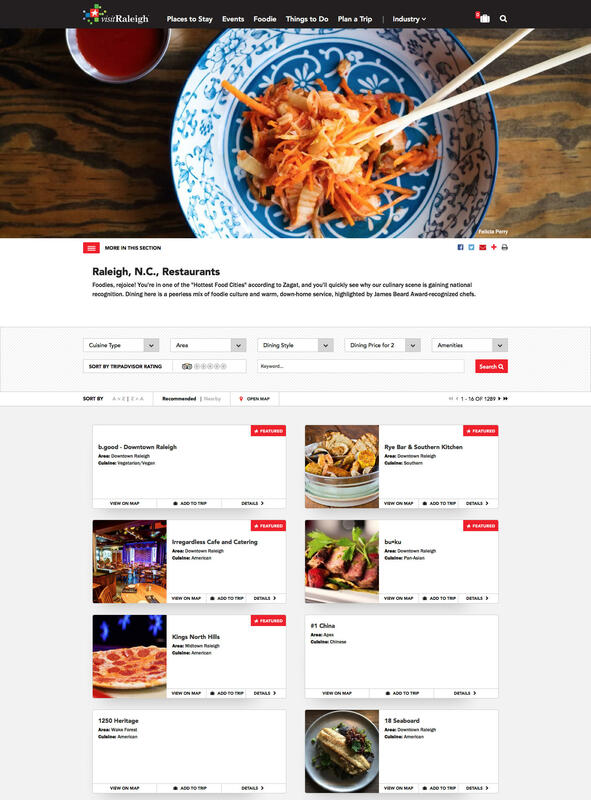 However, the new visitRaleigh.com will be content-rich and constantly changing with seasonality and with fluid visitor demands (and visitors&apos; user-generated content), driven by new GRCVB articles and destination photos appearing as posts throughout the site whenever related to the topic of a particular area or industry webpage. Take a look at the Right Now in Raleigh, N.C., section on the homepage or scroll down to see more popular stories. There are social media integrations (for instance, with recent Instagram photos taken by visitors or residents), an interactive map showcasing content from all of Wake County&apos;s areas and towns, a redesigned calendar of events and much more. From a destination brand perspective, the Raleigh area’s Passionate Minds are featured prominently throughout the site and on visually-striking pages about each. If you don’t see something you’re looking for, check the “MORE IN THIS SECTION" menu on the top left under the header image of most pages on the desktop website (and be sure to click on drop-down arrows under the red navigational menu if using the tablet- or mobile-version website). Wherever you see a red plus sign or down arrow, click to see more site pages under that section. If you have ideas for content, please let us know. We’re always looking for fresh perspectives and new voices around the county to feature. 3. Those first two points are important, but this is the most important to you as a business partner. Over the years, we&apos;ve made many efforts to persuade our hospitality partners to log in at least once a year to PIXL (Partner Information eXchange Login), to keep their listing pages and information up-to-date for visitor use. That has never been more important than it is now, because of the opportunity for our partners to contribute their own content (beyond simply address, phone and URL). If you look at new listing pages by category and subcategory (like the one shown below), you can’t help but notice that the businesses, attractions or events with striking photography command the most attention. We&apos;ve reserved this space for each of you to look your best, as site users have told us time and again that they want to see more photos of the destination when trip-planning. Please take just a few minutes to log in to PIXL, check your content and load the highest quality images that you have. (For information about PIXL, click here. If you have questions, contact assistant marketing manager at abaker@visitRaleigh.com or 919.645.2684). In many cases, we&apos;ve loaded up past photos that we have in our destination library, but you can certainly add to the gallery. This is your place to shine and harvest new customers to your establishment from the 2+ million visitor-users/uses of our site each year. phone photos are fine as long as they fit the criteria above. The point is, it&apos;s up to you to decide how well you want to be presented to potential visitors. The power to shine is in your hands. Overall Raleigh/Wake County can gain new customers/visits, though, if we all pitch in to look our best; that&apos;s what the website research has told us in terms of converting lookers to travel bookers. Take a look at the new visitRaleigh.com, and let us know if you have any questions or comments. We would love to hear from you about the area&apos;s new official tourism website.